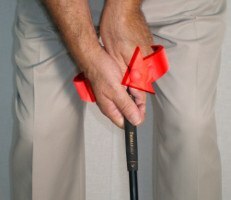 Like the reviews for his music videos with the so-called “Golf Boys,” Ben Crane’s grip is best described as “mixed.” Unlike his singing, Crane’s grip is professional grade. Crane pairs a strong left hand with a neutral right – hence, the term “mixed” – similar to Angel Cabrera. To be sure, Crane’s left hand isn’t all that strong when compared with many of his peers. Crane merely turns the hand far enough to his right so that the “V” between thumb and forefinger points just inside his right shoulder. 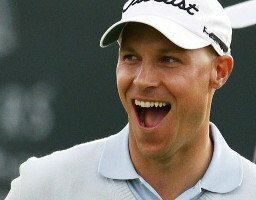 An excellent putter throughout his 15-year PGA TOUR career, Ben Crane’s grip with the flat-stick is a mixed bag as well. But it’s the opposite of his full-swing hold, with a neutral left hand supported by a strong right. This might help him release (rotate) the blade through the hitting zone, which he obviously does quite well. 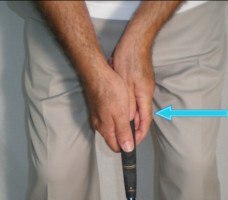 One more note on Crane’s putting grip – it’s extremely light. In fact, it almost looks as though he could drop the putter at any time. 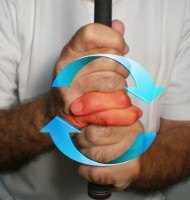 Crane lets his right index finger extend in relaxed fashion on the handle’s underside rather than curling it around, while the right thumb barely contacts the grip at all. Of course, Crane’s light touch is hardly surprising. He’s a light-hearted guy. Just ask his fellow “Golf Boys,” Bubba Watson, Rickie Fowler and Hunter Mahan. Or watch their videos… at your own risk.